How Do You Buy Fairhomes Land? If you decide to buy land with us, it is a simple step-by-step process that we will help you with all the way. Once you have decided on the plot you wish to buy, the next step is to pay a reservation fee. This will secure the plot for you and make sure that the one you have chosen cannot be sold to anyone else. You can make this payment by international bank transfer or over the phone by credit or debit card. The fee is usually $1,000 US Dollars. (All payments are made in dollars to avoid issues with exchange rate changes throughout the purchase process). It is important that you understand the reservation fee is not fully refundable. If you choose to cancel your purchase before completing then there will be an administration charge of $150 plus the cost of returning the monies will be deducted from the fee before we return it. We will also return the fee in dollars, so if the exchange rate has changed it is possible you will lose money here too. We will then produce two documents for you to sign. These are the Florida Vacant Land Contract and the Settlement Statement. You will need to complete one for each plot you are intending to purchase. These will need to be returned to us along with a photocopy of a utility bill and photo identification. You will then need to transfer the balance of the payment to an escrow account in the USA. Once these funds have cleared the title company in Florida will issue a closing date. 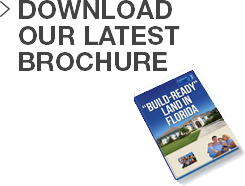 The title company will send out all relevant paperwork and you will be the proud owner of a prime plot of Florida build-ready land! If you have any questions about the buying process and would like more information please contact on +1 905 415 9267.